Alice Waters is a true revolutionary in the culinary world. She in essence started the farm to table movement more than 30 years ago. In her Berkeley California restaurant, Chez Panisse, she sourced all of her food locally from farmers and foragers. In 2014, Time Magazine listed her as one of the 100 most influential people for her work in promoting good food for all. If you want to know more about Alice Waters and her amazing legacy listen to this story on NPR about her. She is amazing in more ways than one, a project she currently works on is called Edible Schoolyards where public school students learn to grow food that is then used in their school lunches. Amazing, right? What an important skill for our children to be learning. Alice Waters is culinary hero to me and I was thrilled to see this book showcasing her in the children’s section of our public library. 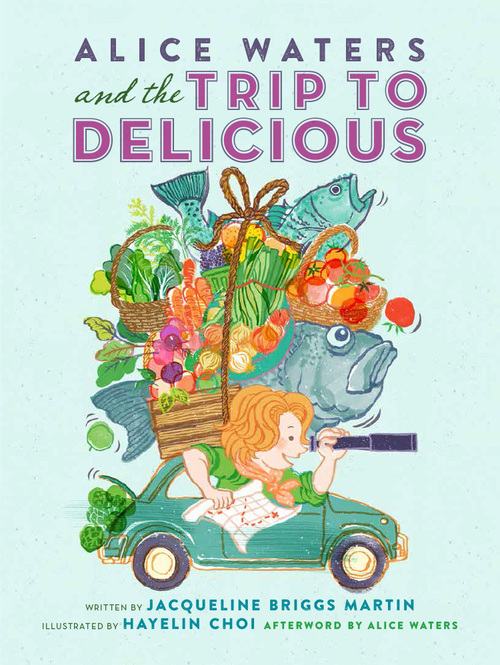 Alice Waters and the Trip to Delicious written by Jacqueline Briggs Martin and illustrated by Hayelin Choi (2014), published by Readers to Eaters is not only pleasing to the eye, but filled with a fantastic story and really fun little factoids about Waters life. To me this book hits on so many different levels of inspiration. Food and eating well, along with growing your own foods and sourcing local foods. Trying new things, which is something we strive to promote in our house. Travel and enjoying destinations and cultures through food. A sense of adventure and how food can take you to new places literally and figuratively. I love this book and think you will too. Please tell me in the comments what you think or if you have other petite foodie recommendations. I admire Alice Waters endlessly too. As for books, did you see this list? I hadn’t seen this list yet, thanks so much for sharing. I love that so many books are available now to promote food in such a positive and educational way.